Agricola Street getting Switched in 2014. I’ve said it before and I’ll say it again: I love Switch. What’s not to like about a pop-up linear park in the middle of the city on a Sunday afternoon? 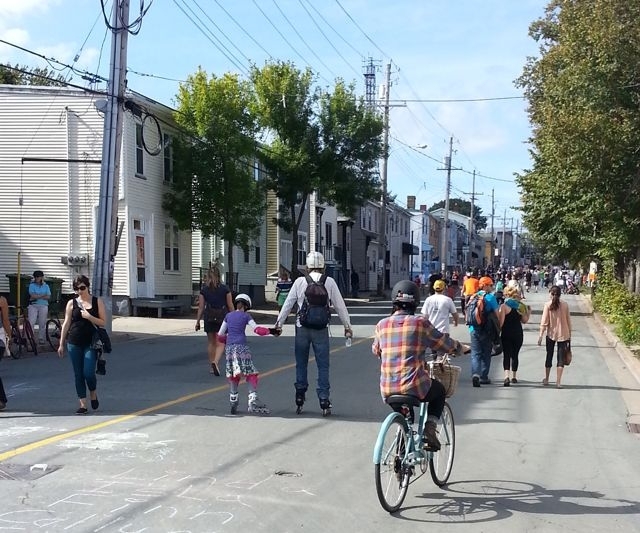 On June 5th, Switch returns to Dartmouth, opening up a two-kilometre stretch along Portland Street and Prince Albert Road to walkers, cyclists, skateboarders, and basically anyone outside of a car. Businesses will set up shop along the corridor, and community groups and artists will animate the route with everything from music to bouncy castles to yarn crafts. The idea, besides providing outdoor recreation opportunities on a summer Sunday, is to change our attitudes towards the city and our streets. Of course Penalosa’s Open Streets initiatives tend to have two things going for them that Switch is still working towards: length and frequency. Open Streets routes need to be long enough to connect neighbourhoods and amenities, according to Penalosa. Then “it starts being something that you use as a means, not as an end in itself.” And then there’s frequency: Open Streets events need to happen on a regular basis, so they work into the rhythm of city life. Back in 2012, when it first came to Halifax, the original Switch concept was for a five-kilometre route running the length of the Peninsula, eventually connecting Africville with Point Pleasant Park, in a weekly Sunday afternoon active transportation corridor. But the red tape involved in such a lengthy route proved a barrier, as did the cost. The red tape has since been relieved somewhat by the city, but the cost remains a problem. Closing a street for a festival or event is a costly business, and it’s mainly because of a technicality in our Motor Vehicle Act (MVA). But our licensed traffic control workforce can’t handle traffic for events like Switch, because the MVA limits them to construction projects only. Which means that street events are required to hire police officers for extra duty, at much higher rates than your average traffic controller. Police officers on extra duty patrol one of the intersections affected by Switch Halifax in 2014. “It really is just a quirk in the MVA that should be corrected,” says former cabinet minister and now independent MLA Andrew Younger, who put forward an amendment to do just that in April. Despite years of organizers and city officials looking for solutions to the high cost of Switch, a Facebook post by Tim Rissesco, who heads up the Downtown Dartmouth Business Commission, seems to be the source of the simple fix. After some quick social media interactions by Rissesco, Younger, and city councillor Waye Mason, an amendment was born. It turns out Facebook can be a productive use of time. This comments thread is in response to an article posted by Tim Rissesco about Toronto plans to move their traffic control from police to trained controllers. Unfortunately, our provincial government seems poised to ignore Younger’s fix, as the legislature is expected to wind up by the end of the week, with the amendment sitting motionless after a first reading. “I was hoping they would pass it this session because it could have the immediate effect of saving a lot of events across the province money this summer,” says Younger. The bill, or a similar one put forward by the government, stands a good chance of success in the fall, particularly if the public support keeps up, and if municipal councils come on board, says Younger. “We’ve been getting pretty regular emails from people, and some of them have been copied to the Department of Transportation and the minister, so my hope is they will see this as something valuable.” Support from municipal councils “would probably guarantee that it would move forward,” he says. Eliza Jackson is positive about the possible effects of the legislative change. “If we can have some really well-trained volunteers who can act as traffic control persons in place of police officers, that’s something that will help us move to a more sustainable model for Switch, and hopefully more frequent events,” says Jackson. Switch is proposing an expanded Halifax route for this fall, connecting the Hydrostone Market to Spring Garden Road, then heading back north along Barrington to Grand Parade. The route still needs to be approved by Halifax’s special events task force. Financial support is coming from the business commissions on the route, and the organizers have also applied for a community events grant from the city. Switch is one of many open streets events across the continent inspired by Ciclovia in Bogota, Columbia, where every Sunday over 115 kilometres of streets are closed to cars, and upwards of 1.5 million people walk, bike, skate and participate in a host of exercise classes and activities. Good luck getting any idea Younger approves of passed by this government. I have experience as both a (construction) traffic control person, as well as traffic control for street events (road races). Having driven around various places, I can say, at least with in North America, NS has some of the most strict and safe traffic control regulations there are. I can say that cops, city or RCMP, are frankly worse than useless as far as traffic control goes. There is a level of controlled areas that they just don’t do. Signs, cones, barrels, its very much not a random design. Cops show up with, I guess an attitude, vest, and gun, and figure that protects them, and those they are protecting, from the psychology of drivers and the physics of driving. I guess the theory is that you don’t need 200m worth of signs and 100m worth of barrels to alert distracted drivers, attitude alone will stop them. Oh, BTW: it’s a two day course for the TCP (Traffic Control Person) course, and one day for the TWS (Temporary Workplace Signing) class. TCP’s are those who actually can direct traffic with the stop/slow signs, and TWS qualifies one to design a specific sign layout.